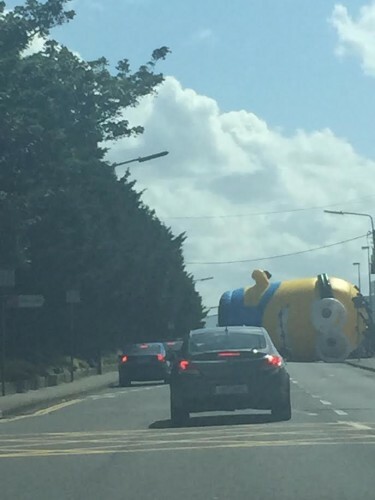 MOTORISTS IN THE Santry area of north Dublin got a shock this afternoon, as a giant inflatable Minion flew loose of its restraints and tumbled onto the Old Swords Road. Gardaí had to be called, and the air was let out of the inflatable. According to a witness, one driver had the wing-mirror knocked off his car. But otherwise there were no injuries. "I'm not sure how it got loose but I just saw it coming loose and flying across the road as we were driving," Erin Van Londen, from Portmarnock, said. "It's been very windy in the area." A motorist's wing mirror was damaged by the escaped inflatable, and the incident caused traffic problems for some time before it was deflated and taken away. "I actually rang the gardaí. It was quite an odd thing to have to report," Erin said. They came and sorted it all out. They deflated it on the road and then they ended up having to get a wheelbarrow to get it out of the way. The Minion, before it was deflated was between "30 and 40 feet" high, she said. "We got quite a shock. Luckily it didn't seem to cause much damage." Could it have had more serious consequences? However, a local councillor warned that the escaped Minion could have had serious consequences. In a statement this evening, Cllr Paul McCauliffe said he has referred the incident to Dublin City Council's planning enforcement department to investigate if the inflatable Minion was the subject of any planning regulation. He also wants to find out if the correct health and safety measures were in place. "Fairground events and festivals are really important in bringing footfall to our city villages but even the smallest events have health and safety conditions," he said. "I have asked the Council to provide me with a report on the incident and for the operators of the fairground to be interviewed by council officials."